blade, combination blades rip more slowly. •Crosscuts are very, very good. We compared the crosscut edges produced by our combo blades with the edges produced by an 80-tooth crosscut blade. The best of the combo blades came pretty close, but they couldn't duplicate an 80-tooth blade's mirror finish. (Sec Best & Worst photos, page 67.) •Material makes a difference. A blade's cutting smoothness varies with the materials and the type of cut. 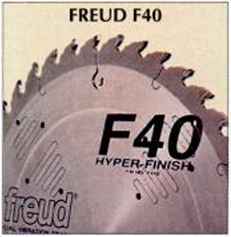 Some blades did better cross-cutting than ripping (the Freud LU84R, for example), and some blades, such as the two DML models, produced better results cutting plywood than solid wood. (Sec chart.) •Expect chipping in MCP. None of our test blades produced chip-free cuts in MCP. 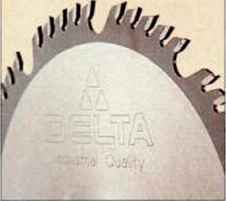 To achieve excellent cuts without chipping the brittle, super-thin melaminc coating, we recommend a "high-ATB" or "triple-chip ATB" blade made especially for man-made materials. Or you can score along the cutting line with a mat knife before cutting with a combo blade. We got good to excellent overall results from every blade we tested. 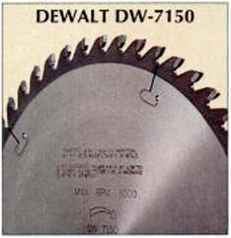 Even the lowest-rated blades delivered acceptable cuts: sawn edges that can be made into finished surfaces with a pass on the jointer or a couple of passes with a hand plane. Take a look at our performance ratings and you'll see plenty of 4's and 4.5's—very good and better. In fact, the top 11 blades in our tests all earned overall ratings between very good and excellent. Editors1 Choice—The two most expensive blades—the Forrest Woodworker II at $107 and Ridge Carbide at $119—came away with the highest overall scores. They were followed closely by the Oldham 50-tooth blade at $79. This trio earns our Editors' Choice award for best performance regardless of price. They produced super-smooth ripped edges in 3/^. in. pine and oak, with absolutely no saw marks visible to the naked eye. With these top three blades, we also got excellent crosscuts, surpassed only by an 80-tooth dedicated crosscut blade. The crosscut edges were slightly rough to the touch but with no tooth marks and with no chipping on the bottom face. And we got very good plywood cuts with only minor chipping of the bottom face veneer. (See Highs & Lows, page 67.) If super-smooth cuts from the tablesaw are important to you, and you're willing to part with $79 or more, you will find any of our three Editors' Choice winners to be a great investment. Close on their heels were the 40- and 50-tooth blades from Craftsman and the Oldham 40-tooth blade. These blades made very good cuts in most of the categories.